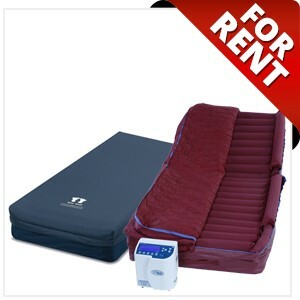 Hospital Beds are specially designed for individuals in need of some form of health care. These hospital beds have specific features both for the comfort and well-being of the individual and for the convenience of caretakers. Hospital beds and other similar types of beds are used not only in hospitals, but in other health care facilities and settings, such as nursing homes, assisted living facilities, and in home health care. 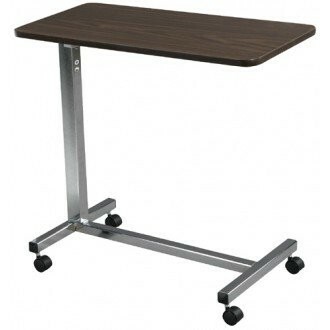 Sherman Oaks Medical Supplies carries a wide variety of types & brands of hospital beds. From regular Semi Electric Hospital Beds & Full Electric Hospital beds to Home Care Hospital Beds, we have it all! 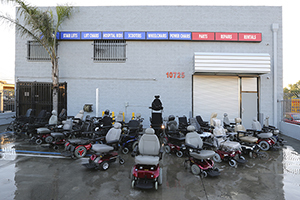 We carry manufacturers, such as Invacare, Joerns, & Basic American. Sherman Oaks Medical Supplies also offers the option to Rent your very own Hospital Bed. 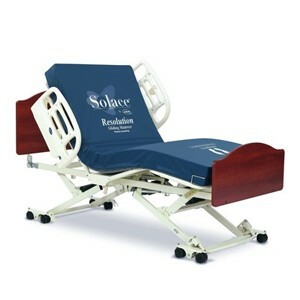 A Hospital Bed is a specialty bed that features adjustments to raise and low the head and foot sections of the bed. These are the standard features that a hospital bed frame will have, but there are a variety of beds that have more positions and functions available. A key function that is always recommended is the base adjustment. This adjustment raises the entire bed frame up and down allowing for easy transferring in and out of the bed. When the patient is getting into the bed frame you can lower the frame. By lowering the frame the user is then able to sit safety into the bed as well as in the correct position which is the center of the bed. By not having this feature shorter users who can not lay down in the center of the bed, and as a result they risk falling out of the bed frame. When getting out of the bed frame, users with trouble standing from a sitting position can raise the base of the bed to easily stand up. Hospital Beds that have all 3 of these features (Head, Foot, & Base) are called full electric hospital beds. 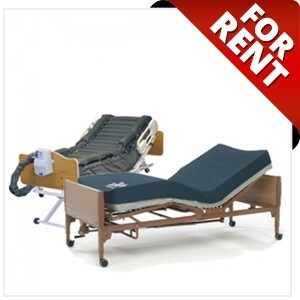 The full electric hospital beds are the most popular beds on the market. 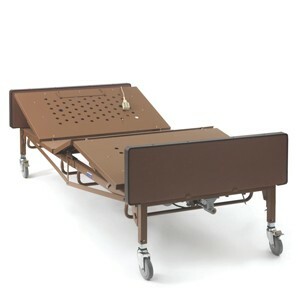 Basic Hospital Bed: A basic hospital bed is an electric bed that either can come fully electric, with an electric head, foot, and base or the bed frame can come in a semi-electric which has an electric head and foot, but in order to adjust the entire base of the bed you would need to do it manually with a hand crank. Basic hospital beds are great for people with short term needs or for those who just need simple assistance while getting in and out of bed. Basic Hospital beds are great because they are quality long lasting beds that are cost effective. To us we consider it the bed that will "get the job done". 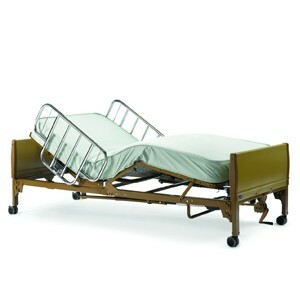 Basic Hospital beds feature railings in both sides of the bed in 2 different styles. The half side rail covers the head section of the bed on the left and right sides. 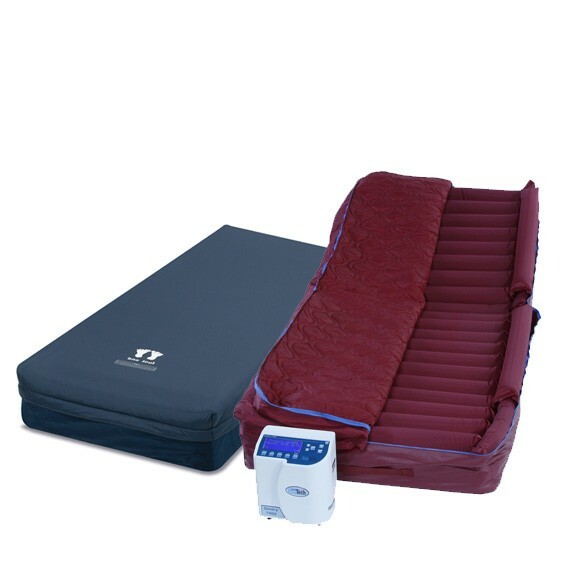 This is recommended for users who need something to grab on to when transferring into and out of the bed, and to also use when laying down for re-positioning. Long Term Care / Homecare Hospital Bed: A long term care hospital bed takes the core functions of a basic bed and adds several more, while making it perfect for home care use. A long term care bed features a solid flat deck. A solid flat deck is the base that the mattress is placed onto. For basic hospital beds the base is made out of springs, so when patients lay down into the bed they sunk down due to the spring deck. The only way to avoid this is with a long term care bed that has a solid frame. Long Term Care Bed frames. Long Term Care Hospital Beds also feature a much nicer modern looking design with wooden head and foot boards. Long Term Care beds also have a numerous amount of available positions depending on whether the user gets a bed with advanced positioning. Advanced Positioning adds Trendelenburg and Reverse Trendelenburg to the bed frame allowing for the frame to have zero-gravity if needed, or to help patient positioning. Trendelenburg tilts the entire sleeping frame. 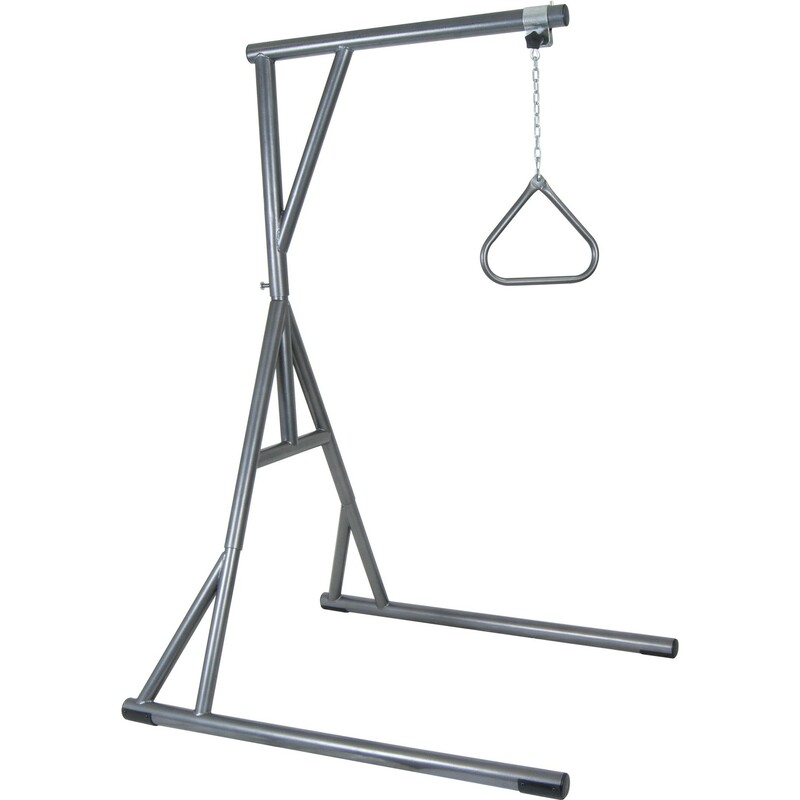 This can help a numerous amount of health conditions that may require specific angles and positions for the body. A long term care bed is the bed frame we would recommend for users who want a "one and done" bed. By one and done we mean that this bed is the only one you will ever need because it has everything needed for long term care of a patient and is built to last with warranties reaching up to 15 years. 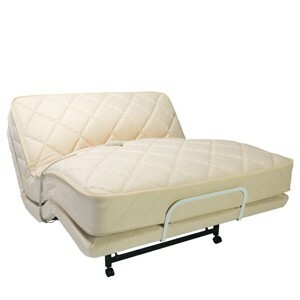 Hill-Rom Hospital Beds: A Hill-Rom Hospital Bed is the top of the line hospital bed. Hill-Rom Hospital Beds are the same hospital bed used in 75% of hospitals. Hill-Rom Bed Frames feature several positions and functions allowing for maximum patient comfort. Hill-Rom Hospital Beds also can have patient scales and bed alarm systems as well. Hill-Rom has several bed frames that can help users from mild to severe conditions. 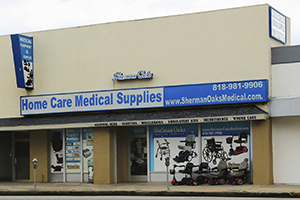 Sherman Oaks Medical Supplies has been the premier Hill-Rom dealer in the Southern California Area For Over A Decade, so you can rest assured that you are in good hands. Our certified technicians are also trained and licensed by Hill-Rom for bed repair and maintenance.